I rarely make fried chicken wings at home. 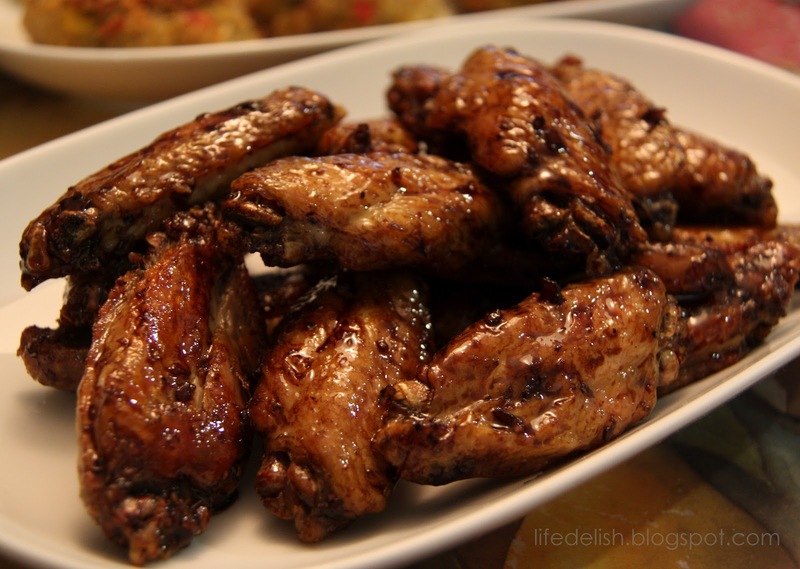 Usually, our chicken wings are marinated for a couple of hours before they are baked in the oven. It’s a healthier alternative to fried chicken wings, involves less active time when cooking, and leaves you with much less cleaning up. Plus I dare say they taste as good, if not better. But we don’t always have the time to prepare and marinate ahead. So over the weekend, I tried a quicker and easier recipe. Instead of marinating the wings, they were simply patted dry, tossed in salt and pepper, baked on high heat till the skin turned crispy, then coated in glaze. I tried two different kinds of glaze with them: the first was a balsamic-soy glaze which allowed the wings to remain super crispy while giving them a deliciously sweet coating; and the other was a spicy sauce akin to buffalo sauce, but with an Asian twist because of the Thai chilli sauce that went into it. The balsamic-soy wings turned out to be more popular. While the buffalo wings had a little more kick because of the heat, the glaze was absorbed into the skin, which compromised crispiness. But still pretty good, especially considering it was so easy to do. Pat wings dry and toss with olive oil, salt and black pepper till well coated. Set aside 15 minutes. Preheat oven to 260 degrees celsius. Arrange wings on 2 shallow trays (lined with foil), without crowding. Put one tray in highest and the other in the lowest rack of the oven and bake wings until skin turns golden brown and crispy. If using whole wing, this should take approx 35 minutes. If using only mid-joints (as shown in the photos), then 25 minutes should be sufficient. While wings are baking, prepare the Glaze and Sauce. For Buffalo Wings Sauce, simply whisk all ingredients together in a bowl. For Balsamic-Soy Glaze, combine soya sauce, vinegar, sugar and brown sugar, and boil in a saucepan on medium to high heat till thickened and somewhat reduced. Add minced garlic and continue to boil for 5 minutes. Remove from heat and whisk in butter till melted and well-combined. 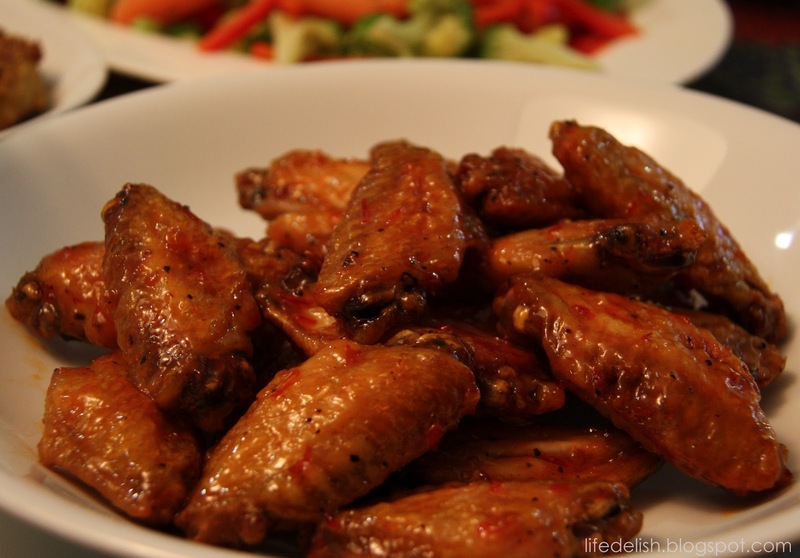 Remove trays from oven and set aside to allow wings to rest for 10 minutes before removing. Divide the wings between 2 large bowls. Toss one in the buffalo sauce and the other in the balsamic-soy glaze.